Automotive Paints & Coatings Market size valued at over USD 16 billion in 2018 and is estimated to exhibit around 8% CAGR from 2019 to 2025. Increasing vehicle production owing to improving disposable income across the globe are driving the automotive paints & coatings market size over the projected timeframe. The availability of multiple car variants with the provision for factory color customization alternatives further accentuates the market demand. Automobile manufacturers are offering a wide range of dual color variants in their product portfolio for attracting a wide customer base. The rising requirement for repainting and refinishing of vehicles after a certain age is providing a positive outlook for the industry expansion. Increasing cases of accidents and crashes across the globe owing to traffic congestion are contributing towards increasing the product demand. Additionally, proliferation of metallic paints and coatings offering superior aesthetics to the vehicles, supports the automotive paints & coatings market size expansion over the projected timeframe. Technological advancements including superior UV ray protection along with advanced scratch resistance properties are positively influencing the product adoption over the projected timeframe. Moreover, industry players are also investing in R&D for introducing water resistant paints with lower VOC contents, thereby contributing significantly towards expanding the automotive paints & coatings market size. Governments across the globe are introducing multiple policies and guidelines for ensuring safe and pollution free working environment for workers associated with the automotive paints. The Department of Toxic Substances Control offers multiple guidelines and standards that promotes the safer operation and usage of appropriate tools for using automotive paints safely, thereby positively influencing the automotive paints & coatings market growth over the study timeframe. The emissions from applying automotive paints and coatings along with the presence of VOC content in such paints may limit the market reach. Additionally, higher costs associated with repainting and refinishing entire car bodies may further restrict the market growth. However, industry players are investing in R&D for developing advanced paints with reduced emissions for complying to the stringent emission norms. For instance, Nippon offers Nax Pro LV paint with reduced VOC emissions. Light commercial vehicles will grow considerably over the forecast timeframe. This share can be credited to the increasing adoption of such vehicles for facilitating logistics and cargo transportation across cities and towns owing to its compact dimensions. Moreover, the proliferating e-commerce industry and online shopping portals offering door step delivery of products further expands the segment share over the study timeframe. The stringent regulations mandating the maintenance and refurbishment of such vehicles periodically are providing a positive outlook for the automotive paints & coatings market growth. Passenger cars will account for a significant share in the automotive paints & coatings market share. This can be attributed to the availability of a wide range of vehicle models at varied price range offered with multiple paint variants. Moreover, rising preference for repainting and refinishing of vehicles after certain vehicle age to improve aesthetics further accentuates the market size. Increasing cases of accidents and crashes along with the requirement for repairing dents and scratches further boosts the revenue generation over the projected timeframe. In 2018, primers accounted for around 13% share in the automotive paints & coatings market size. This can be credited to the advantages offered including improved corrosion & chip resistance, along with superior smoothness. Primers improve adhesion between topcoat and E-coat, thereby providing improved paint appearance along with complying to stringent regulatory norms. Manufacturer are also developing advanced primer solutions that can be used in stainless steel and fiberglass, thereby accelerating the automotive paints & coatings market growth. Clearcoat will showcase considerable growth over the forecast period. This growth can be credited to the benefits offered including superior UV protection. Additionally, the coating offers superior protection against oxidation and forms a protective layer over the paint coat, thereby minimizing the probabilities of scratches. The ability of the clear coats to offer superior gloss finish along with improving vehicle aesthetics further enhances the industry share over the study timeframe. Waterborne accounted for a significant share on the automotive paints & coatings market size. This can be credited to the requirement for lower clear coat over such paints. Additionally, the technology reduces VOC emissions significantly, thereby not affecting workers health. The reduced solvent content along with superior finishing operations further expands the technology adoption over the study timeframe. 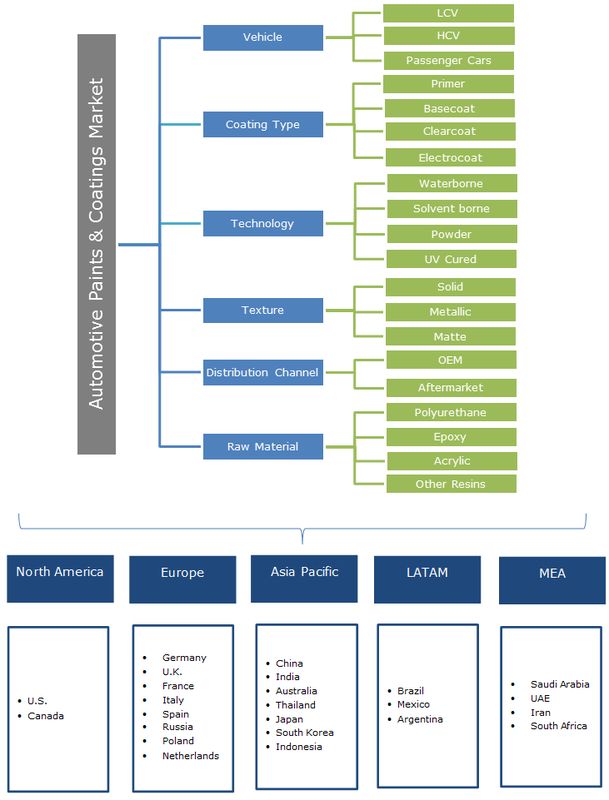 Power automotive paints & coatings market share will witness over 5% CAGR over the study timeframe owing to the durable finish of a wide range of color /across diversified metals. Additionally, the coatings are available in a wide variety of finishes including glossy, fluorescent, clear, and wrinkle among others further expands the market size. The non-availability of solvents along with the non-requirement for equipment for pollution control further expands the segment share over the study timeframe. Metallic will hold a significant share in the automotive paints & coatings market size. This can be attributed to the availability of unique finishes along with its capability to reduce the probabilities of fading. Moreover, the metallic paints are also capable of hiding scratches or dings, that contribute towards improving the segment size. Matte accounted for considerable growth in the automotive paints & coatings market size over the projected timeframe. This growth can be attributed to its unique features including prevention of oxidation and discolouration, superior protection against strong chemicals, UV rays, and road salt. The higher durability along with hydrophobic properties further supports the automotive paints and coatings market expansion. Automotive paints & coatings market size from OEMs will hold a significant volume share on account of increasing vehicles sales across the globe. Automobile OEMs are focussing on increasing their sales by introducing advanced paints and coatings complying to stringent environmental regulations, thereby driving the segment share over the projected timeframe. Aftermarket will witness considerable growth in the automotive paints & coatings market share owing to increasing requirements of repair & maintenance of vehicles and higher usage of refurbished cars in emerging countries. Furthermore, proliferation of online networks distributing automotive aftermarket products in association with prominent auto manufacturers are further enhancing the segment size. 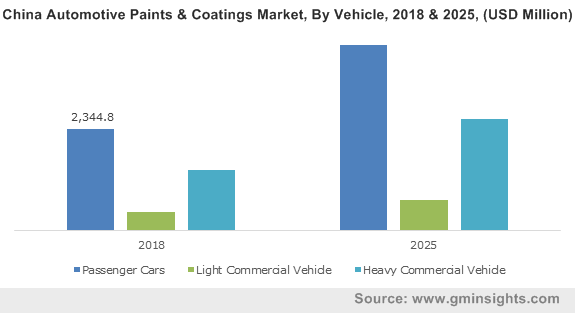 Polyurethane-based coating segment will exhibit significant growth in the automotive paints & coatings market size owing to its wide adoption by automotive manufacturers. The benefits offered by the raw materials including superior abrasion & solvent resistance and dry cleanability further expands the segment size. The absence of volatile organic compounds, offering reduced carbon emissions along with improved finishing properties further expands the segment share over the projected timeframe. Acrylic accounted for a considerable revenue share over the projected timeframe on account of its advanced characteristics including UV resistance, transparency, and improved colour ability. Manufacturers are utilizing acrylic paints due to its lower production cost coupled with exterior durability, thereby propelling the segment growth over the projected timeframe. 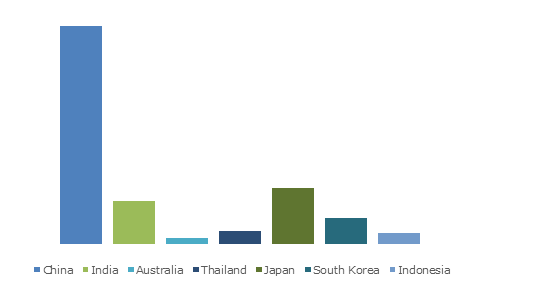 Asia Pacific accounted for a significant revenue share in the automotive paints & coatings market size over the study timeframe. This share can be credited to the improving road infrastructure, rapid industrialization, and availability of cost-efficient labour. Economic development in countries including China, India, and Japan along with increasing vehicle affordability will positive influence the industry expansion. Rising traffic congestion leading to accidents and scratches along with higher requirement for restoring vehicles to the original state further supports the regional share. Europe will showcase considerable growth in the automotive paints & coatings market size on account of stringent regulations pertaining to vehicular and environment emissions. Rising demand for contemporary automotive paints and custom-made paints in European countries including Germany, France, UK, Spain will encourage the segment expansion. Moreover, automobile OEMs are focussing on offering wide customizable paints and coatings for customers to alter their vehicles according to their requirements, thereby expanding the market size over the study timeframe. Major players in the automotive paints & coatings market size include PPG, AkzoNobel, BASF SE, Nippon, Nerolac, 3M, KCC, Valspar, Axalta, and Vogel Paint, Inc. Product portfolio expansion and merger & strategic acquisitions are among the key strategies adopted by industry participants for improving their business share. For instance, in June 2017, Sherwin Williams announced the acquisition of Valspar corporation. This acquisition enabled the company to expand its product portfolio and significantly improve its market share. Automotive paints & coatings offers a protective layer to the automotive body that provides enhanced durability, environment protection from chemicals, and improves corrosion resistance. With increasing demand for enhanced aesthetics in vehicles, manufacturers are developing automotive paints & coatings market technology to maximize efficiency and to meet environmental regulations. Development in automotive paint pigments are accomplished by OEMs with improved paint chemistries and processing to enhance colour & appearance, thereby catering to the increasing customer requirements.